The Hearsay Rule is a rule regarding the evidence for criminal and civil cases. Specifically, Colorado law (CRE 801) defines hearsay as, “a statement, other than one made by the witness while testifying at the trial or hearing, offered in evidence to prove the truth of the matter asserted.” In other words, hearsay generally refers to utterances made by someone other than the witness in court who is testifying about that specific statement. Knowing how to apply the Hearsay Rule for evidence in criminal cases can be crucial to building the strongest possible defense for the accused. Colorado law regarding the Hearsay Rule is very specific, and knowing when it can be used to support a defense case (by either getting prosecutors’ evidence against the defendant thrown out or getting evidence in favor of the defendant admitted) can be critical to obtaining the best possible verdict for the accused. In this two-part blog, we will take a closer look at some important facts to know when it comes to the Hearsay Rule for evidence. Keep in mind that the information provided in this blog is general in nature and that you are advised to consult with Attorney Christopher Griffin for more specific information about the best defense strategies for your specific case. Fact 1: Statements qualifying as “hearsay” are generally not admissible as evidence in court. Colorado law (CRE 802) generally prohibits the use of hearsay statements as evidence in a criminal case. 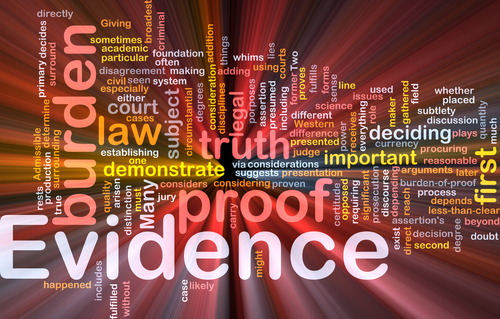 This means that, when a witness describes what someone else has said about a defendant or crime, that statement cannot on its own be used as evidence. Instead, the specific person who made the statement in question will typically have to take the stand and make his own statements for them to be considered evidence in the case. It’s generally agreed that jurors will be better able to determine the credibility and reliability of a person making a statement when they can see that person for themselves. Hearsay can’t really be cross-examined, so it can provide an unfair advantage to one party of a case. When the hearsay is provided by the prosecution, it can violate a defendant’s right to confront and cross-examine his accuser(s) or those who are providing testimony against him. Fact 2: Former testimony in court is not considered to be hearsay. This is an important exception to the Hearsay Rule for evidence. When someone has previously made a statement under oath as part of some other court proceeding, that former testimony can be used as evidence in court and will not be considered to be hearsay. This is because, with former testimony, there was previously an opportunity for cross-examination of the witness who made the statements in question. Be sure to look for the second part of this blog for some more info on the Hearsay Rule for evidence in Colorado.